Luxury – Make items look luxurious by showing them on contrasting colored textured fabric. Show lighter items like wine glasses or glass bowls on a dark navy or black velvet background, and dark items like a black leather wallet on a creamy or caramel colored fabric. Throw in a little silk-faced satin or a gauzy scarf to add color and the display becomes both fun and classy. Lighting – Everyone knows metallics, crystals and foils sparkle under the lights. Don’t short-change yourself by relying on ceiling fluorescent lighting for any of your accessories that have gold or silver accents or candy boxes that are wrapped in reflective foil papers. Add some ambiance to your entire department or shop with softer lighting and pin spots on key items you want to highlight. Try soft colored lighting in small spotlights or under-counter lights. Deep purples and midnight blues can add an aura of mystery to your products. Glass – It’s a thankless job, but it will hit the bottom line – clean glass display cases. Nothing turns shoppers off more than dirty, finger-printed glass. 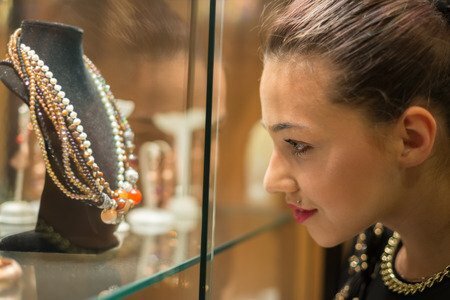 Make sure top and sides of display cases are cleaned regularly and any mirrors are spritzed, as well. Glass display cases should hold your most valuable items, and should also make interaction with guests easy. Select cases with inventory storage area just below the display, and have keys readily available to trusted employees. Creative Slat Wall Displays – You can create just about anything with a slat wall display and some pegs. Hang small candy boxes wrapped in festive paper in a heart shaped-peg arrangement or make x’s and o’s out of hanging pairs of red, white and pink socks. Packaging – The little blue box with white ribbon is the statement package in jewelry. The shiny black bag with pink tissue is the signature in lingerie. You can make your statement as well. Invest in a box, bag or wrapping that reflects your image and is a one-of-a-kind, recognizable package. This season of gift-ables is a great time to start. Whether it’s a black and white mini shopping bag, pink polka-dotted tissue paper or a neatly wrapped box with a seal, make it consistent and make it bold. Your customers will delight in giving gifts they selected from your store, and their recipients will thank you, too!